Heel pain is most often caused by plantar fasciitis, a condition that is sometimes also called heel spur syndrome when a spur is present. 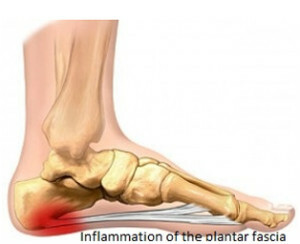 Plantar fasciitis is an inflammation of the thick band of fibrous connective tissue (fascia) running along the bottom (plantar surface) of the foot, from the heel to the ball of the foot. This strong and tight tissue contributes to maintaining the arch of the foot. It is also one of the major transmitters of weight across the foot as you walk or run. Therefore, the stress placed on this tissue is tremendous. This condition is one of the most common complaints relating to the heel. The pain is usually felt on the underside of the heel and is often most intense with the first steps of the day, or first step after a long period of being off your feet. 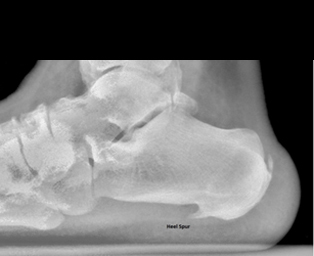 A heel spur is a bony growth that occurs at the attachment of the plantar fascia to the heel bone (calcaneus). A heel spur can be present on a foot with no symptoms at all and a painful heel does not always have a heel spur present. Biomechanical factors: The most common cause of plantar fasciitis relates to faulty structure of the foot. Over-pronation (flat feet) is the leading cause of plantar fasciitis. Over-pronation occurs in the walking process, when a person’s arch collapses upon weight bearing, causing the plantar fascia to be stretched away from the heel bone. High arches and tight tendons along the back of the heel (Achilles tendon) are also structural foot abnormalities that can lead to plantar fasciitis. Aging: The natural process of aging, which may cause tissue in the heels to weaken over time and/or promote wear and tear is sometimes a factor in the development of plantar fasciitis. Footwear: Non-supportive footwear puts abnormal strain on the plantar fascia and can also lead to plantar fasciitis. Improper footwear can exacerbate the problem caused by the original genetic structure. The most common complaint is pain and stiffness in the bottom of the heel. Pain is often at its worst first thing in the morning. Often the pain disappears after the first steps and can reappear after standing or walking for long periods. The heel pain may be dull or sharp and the bottom of the foot may also ache or burn. Mild swelling is possible and there may be difficulty bending the toes towards the shin (called “dorsiflexion” of the foot). Physical exam: Clinical observation is typical to make the diagnosis. Your doctor will ask you questions about the symptoms you are experiencing. The structure and biomechanics of the patient’s entire foot is examined. 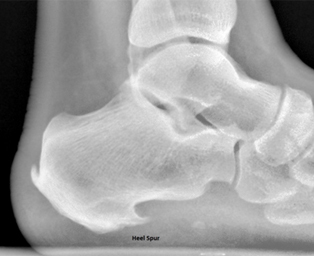 X-rays: Standard weight-bearing radiographs in the lateral and anteroposterior projection demonstrate the biomechanical character of the hindfoot and forefoot, and may show other osseous abnormalities such as fractures or rheumatoid arthritis in the calcaneus. Radiographs serve as an aid to confirm the clinician’s diagnosis. Stretching exercise: Exercises that stretch out the calf muscles help ease pain and assist with recovery. Try gentle calf stretches for 20 to 30 seconds on each leg. This is best done barefoot, leaning forward towards a wall with one foot forward and one foot back. Your doctor can give you recommendations for appropriate stretching exercises or in some cases may refer you to a physical therapist. Appropriate shoes: Wearing supportive shoes that have good arch support and a slightly raised heel reduce stress on the plantar fascia. Wear shoes that fit well and consider purchasing shoes with shock-absorbent soles, rigid shanks, and supportive heel counters. Avoid going barefoot because walking without shoes puts undue strain and stress on your plantar fascia. Ice: Putting an ice pack on your heel for 15 minutes several times a day helps reduce inflammation. Place a thin towel between the ice and your heel; do not apply ice directly to the skin. Activities: Cut down on extended physical activities to give your heel a rest. Avoid running on hard surfaces and other high impact sports. Medications: Oral non-steroidal anti-inflammatory drugs (NSAIDs), such as ibuprofen, may be recommended to reduce pain and inflammation. Padding and strapping: Placing heel cushions in the shoe softens the impact of walking. Strapping helps support the foot and reduces strain on the fascia. Orthotic devices: Custom orthotic devices that fit into your shoe may be prescribed for correcting biomechanical imbalance, controlling excessive pronation, and supporting the ligaments and tendons attached to the heel bone. Orthotics can effectively treat many cases of heel and arch pain without the need for surgery. Injection therapy: In some cases, corticosteroid injections are used to help reduce the inflammation and relieve pain. Removable walking cast: A removable walking cast may be used to keep your foot immobile for a few weeks to allow it to rest and heal. Night splint: Wearing a night splint allows you to maintain an extended stretch of the plantar fascia while sleeping. This may help reduce the morning pain experienced by some patients. Although most patients with plantar fasciitis respond to non-surgical treatment, a small percentage of patients may require surgery. If, after several months of non-surgical treatment, you continue to have heel pain, surgery will be considered. Both the traditional and minimally invasive surgical correction techniques are performed at the Coeur d’Alene Foot and Ankle Surgery Center. 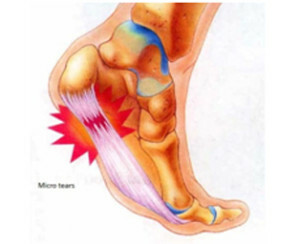 Both techniques involve relieving the tension on the plantar fascia (plantar fasciotomy or cutting of the fascia) and relieving the pain of heel spur syndrome which often involves removing the spur also. Because the minimally invasive techniques are less traumatic, and the recovery time shorter, most patients prefer this method of correction. Each patient is unique, however, and the doctor will discuss which technique he or she feels best suits the patient for optimal outcome. 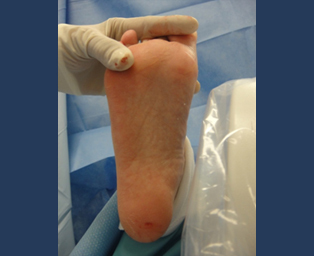 Open or traditional surgical correction techniques involve a large incision, several centimeters in length, which is made on the inside of the heel. 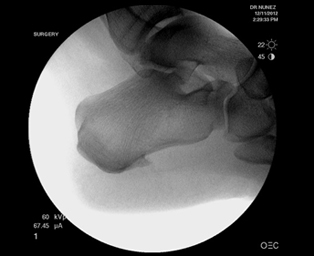 This allows the surgeon access to the spur and the connection of the plantar fascia to the heel bone. 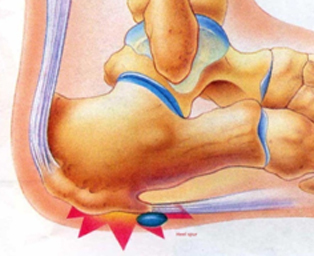 In removing the spur from the heel, the plantar fascia is partially cut and released from its connection to the heel bone. This releases the tension in the plantar fascia, thus relieving the patient’s pain. The incision is closed with stitches, and you are placed in a surgical bandage to protect the foot while it heals. You may be placed in a splint for certain open technique corrections. The large incision into the heel precludes, in some cases, the patient from bearing any weight on the foot for 2-4 weeks. 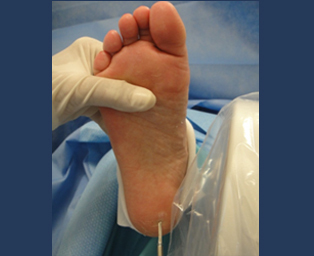 The technique used in minimally invasive or minimal incision percutaneous surgery involves a much smaller incision of the heel for release of the fascia and removal of the spur if present. It involves making a small incision less than 1cm to release the plantar fascia, which may be combined with heel spur removal. Suture is usually not necessary. For this technique, surgeons use instruments which are very fine and rotate at high speed to make tiny, precise cuts. Surgery is performed under Fluoroscopic viewing. There is less trauma to the tissues and surgical times are lessened with this technique, reducing pain and recovery time. Postoperative patients ambulate immediately and are often placed in a surgical shoe or boot to aid ambulation. 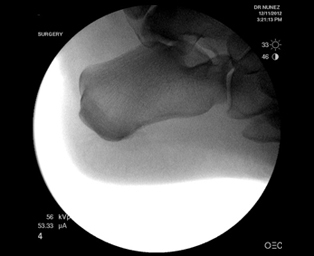 The most commonly performed MIS procedure for correction of heel spur syndrome is the Isham modified Schwartz procedure. Surgeries are performed at the CDA Foot and Ankle Surgery Center and are done with local anesthesia where in the foot usually stays asleep 4 to 6 hours. A small surgical incision is used which enables the surgeon to use fine specially designed instruments to obtain the best long term pain free, functional and cosmetic results. Often times no sutures are required due to the small incision size. Dr. Nunez also uses a fluoroscope during surgery, enabling him to visualize foot anatomy during surgery in spite of the small incisions. The entire surgery takes approximately 1- 2 hours. This includes viewing a preoperative video and procedure explanation, anesthetic administration, setting up the sterile field, the surgical procedure and post operative dressing and instructions. Patients are not required to discontinue their prescription medication unless specifically instructed. There are no restrictions on diet or fluid intake the night before surgery. As recommended by the CDC (Centers for Disease Control), an antibiotic is usually administered at the time of surgery. The patient is given a postoperative pain medication prescription and if appropriate one dose of antibiotic to be taken that evening. Occasionally an RX is also given to the patient for continued antibiotic therapy if necessary according to their medical history. The dressing must stay dry, clean and intact and is not changed until the first post-operative office visit. The patient leaves the facility walking with a special surgical boot or shoe. This will be provided for the patient. Crutches or walkers are usually NOT needed. Academy of Ambulatory Foot and Ankle Surgery. Heel spur syndrome. Philadelphia (PA): Academy of Ambulatory Foot and Ankle Surgery; 2003. 6 p.
The Coeur d’Alene Foot and Ankle Surgery Center is Medicare Certified and an Accredited surgical facility with the Academy of Ambulatory Foot and Ankle Surgery.